Development of the FFFTP is terminated. This FFFTP is Oct 24,2010 version. The update will not be done in the future. Multithread application. You can operate on other files while downloading or uploading. Mirroring of uploads and downloads. You can transfer whole files and subfolders. Supports any FireWall, SOCKS, and One Time Password. 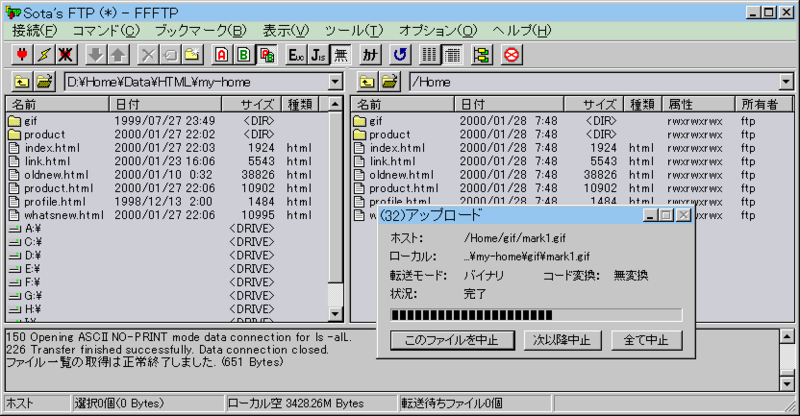 FFFTP is Free Software, which is free for all purposes. Please mail me if you have inquiries about the programs. -> Send a mail. All programs are used at the user's own risk, and no gaurantee is made of their operation nor reparation shall be made for any adverse results. All programs have been checked by ESET Smart Security V9.0 and Kaspersky Security 2017.